World Market Gift Ideas: For Her. 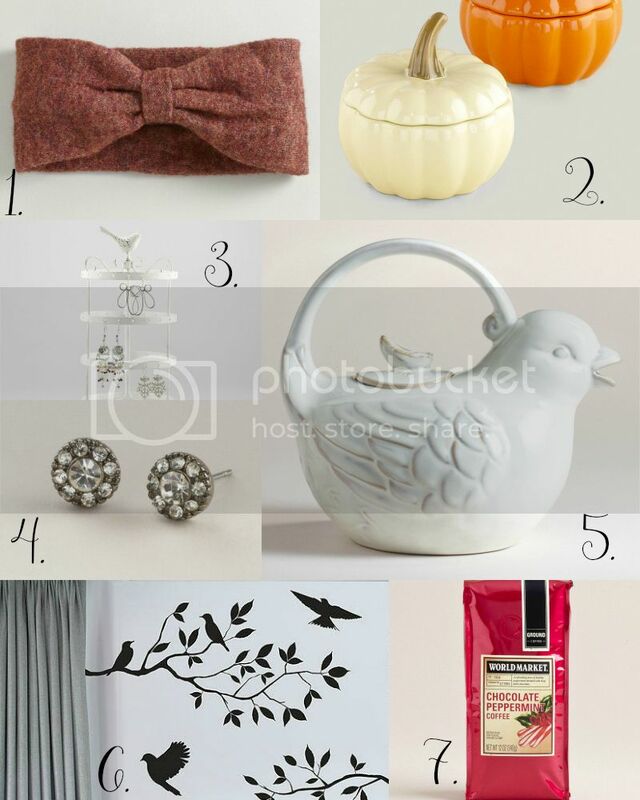 | Home is with You: World Market Gift Ideas: For Her. 1. I just love everything about this head wrap...the color, the bow, and the fact that it would look super cute on just about anyone. 2. These cute little pumpkins, I fell in love with the white one the last time I shopped there, so country chic and you can use it for multiple holidays. 3. I don't know if I've mentioned on my blog before how much I love birds, but oh how I love them so. Now that you know this about me, you can guess that I swooned when I saw this jewelry holder with a bird on top ("PUT A BIRD ON IT!"...anyone? ), it's seriously adorable. 4. These earrings are so pretty and at only $4, how could you not? Perfect little stocking stuffer. 5. It's a bird. And a teapot. Need I say more? 6. I love all the wall decals I've been seeing around lately. This one is inexpensive and it combines two of my favorite things: birds and trees. Plus, it looks like it's small enough to fit in just any open space you might have. 7. I don't know about you all, but this time of year I don't get anything at Starbucks other than Pepperment Mochas, so when I saw World Market had this coffee I had to add it to the list! The first 100 customers to shop in-store on 11/23(Black Friday) will receive a FREE Limited Edition Life of Pi ornament and a FREE Life of Pi movie ticket. The first 100 customers to shop in-store on Saturday, 11/24 & Sunday, 11/25 will receive a FREE Limited Edition Life of Pi Tote Bag and a movie ticket.